(Nanowerk News) Making valuable products, such as fuels, synthetic materials or pharmaceuticals, from renewable raw materials is to date not efficient enough because the microorganisms used only process the raw materials very slowly and generate many by-products in addition to the substances actually wanted. Biotechnologists at Goethe University Frankfurt have now succeeded in optimizing sugar utilization in baker’s yeast. In baker’s yeast, various enzymes compete for sugar molecules that are introduced into the cell by transport proteins. 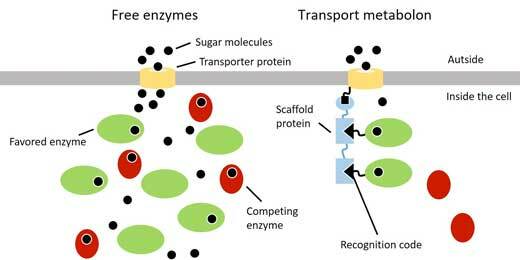 So that the sugar is converted only by enzymes that deliver products desirable from a biotechnological perspective (green ovals), these are connected to the transporter directly via a docking station (picture on the right). Thomas Thomik and Dr. Mislav Oreb from the Institute of Molecular Biosciences at Goethe University Frankfurt have now succeeded in channeling the metabolism of baker’s yeast in such a way that sugar, as the raw material, can be used more productively. In the latest issue of the renowned scientific journal Nature Chemical Biology ("An artificial transport metabolon facilitates improved substrate utilization in yeast"), the researchers present a new mechanism with which the raw materials are delivered directly to the desired enzymes by transport proteins.